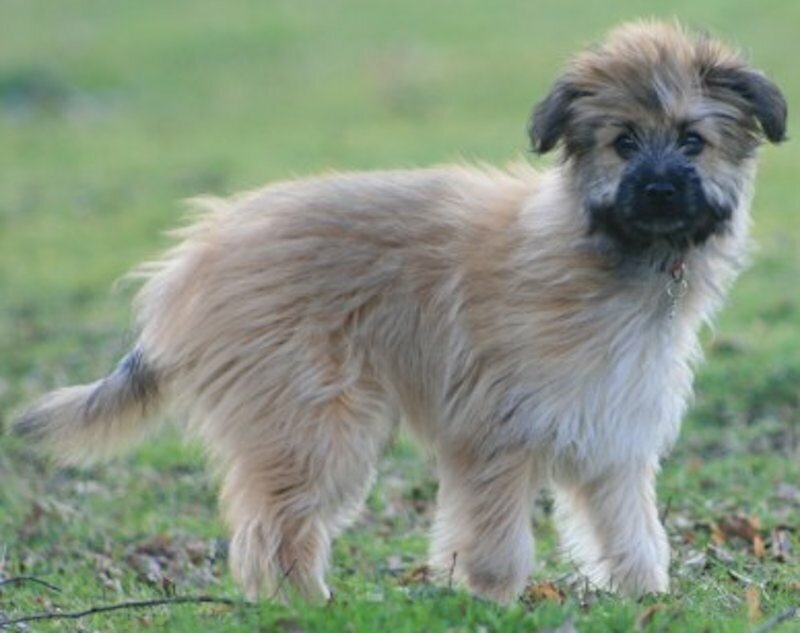 Pyrenean Shepherd Dog or Berger des Pyrenees has been known in the Pyrenees Mountains for hundreds of years but they proved to be a well-kept secret. Smallest of the French herding breeds, the pixie-faced little dogs failed to attract attention outside of their working area. Finally, a breed club was formed in 1923, starting the official life of this Pyrenean dog breed. Berger des Pyrenees Temperament: Don’t let the Pyrenean Shepherd Dog’s small size fool you! This is a hardy, assertive, tough herding dog with phenomenal energy. Though affectionate with its own family, the Berger is suspicious of strangers and makes a very good guard dog. Bright, inquisitive and intelligent, the Berger surveys the world with a mischievous expression. General Appearance: A shepherd dog featuring a maximum of nervous influx under a minimum of size and weight. 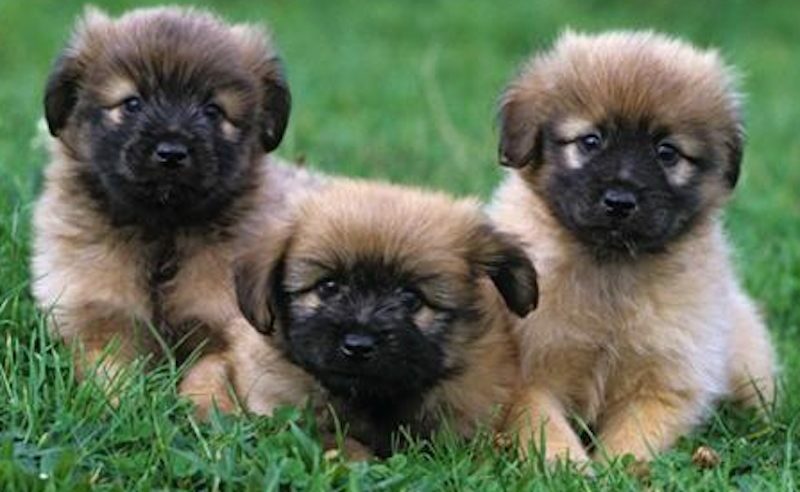 The Pyrenean Shepherd Dog’s always alert expression, cunning and wary looks, together with great liveliness are giving this dog a personal stamp that is not to be compared with any other. Faults: Coarse appearance, lack of liveliness, loaded in muscles, common expression, unsound movement, short or mincing gait. Size: Males 40-48 cm, females 38-46 cm, for very typical dogs an extra 2 cm are permissible. Skull: moderately developed, almost flat with a slightly marked furrow, nicely rounded on the sides. The occipital bone should be little pronounced. Muzzle to blend evenly and in a slight slope with the skull. Stop not visible. On the whole, the head should remind one of the brown bear. Faults: Skull pointed and oblong in shape; head too short, too long or too narrow; marked stop; hair exaggeratedly developed, especially when falling over the eyes. Muzzle: should be straight, somewhat short, the brain skull remaining the dominating part of the head; narrow without exaggeration and wedge shaped. The lips should not be very fleshy and are well covering the lower jaw without any hint of a flew. The mucous membranes of the lips and palate to be black or heavily marked with black. Nose black. The hair covering the muzzle should correspond to the description given by the present standard. Faults: Square, too long or rectangular shaped muzzle; lack of pigment; too much coat with hair falling over the eyes. Eyes: The very expressive eyes should be surrounded by thin eyelids and black rims. They are well opened, of dark brown colour, neither protruding nor deep set. Harlequin and slate gray dogs are allowed a pearl eye or eyes showing a partly depigmented iris, these features being almost always typical with these coats. Faults: Eyes too small, too round, too light; lack of expression. Unpigmented eyelids. Teeth: The canines to be very strong in comparison to the size of the dog. Scissor bite. Level (pincer) bite permissible. Ears: Berger des Pyrenees ears should be rather short, reasonably broad at their base and neither sit too close on the top of the skull, nor be placed too far apart on the sides of the head. Cropped or uncropped. An uncropped, well placed ear is not objectionable. A naturally upright standing ear is always betraying a cross with some other breed. Faults: Ears set too low and badly carried. Neck Rather long, fairly well muscled, blending nicely with the shoulders. Faults Badly set on, coarse, weak, short or too long. Shoulders: Should be rather long, fairly obliquely set, the points of the shoulder blades to reach over the topline. Faults: Shoulders too straight or too short. Body: Lean. The back to be of good length and strong. Loins short and slightly arched, appearing to be higher than they really are due to the thick layer of coat covering the rear. Croup rather short and sloping. Flanks not very deep. Ribs slightly sprung. Chest moderately developed and reaching to the elbows, seldom deeper. Faults: Coarseness, cobby shape, straight topline. Tail: Well feathered, not very long, set on rather low and with a hook at the tip. Should not be carried above the backline when dog is excited. Most tails are docked but there are also naturally short tails. Docked or undocked. Faults: Bad tail carriage or missing hook. Forequarters: Lean, sinewy, feathered. Carpus to be well marked. Hindquarters: Well developed, muscled but short upper thigh. Hocks lean, low set, moderately bent and sometimes placed somewhat narrow, a feature especially common with dogs born and reared in the mountains. All joints to be well bent. Dogs with semi-long coat have no feathering on the legs. The rear legs can display single or double dewclaws. Since this is an age old feature of the shepherd breeds, preference should be given to dogs having dewclaws. Faults: Straight hocks; joints lacking in springiness. Feet: Lean, rather flat, or definitely oval shape. Pads dark, nails small but strong. They should be well covered by hair growing between the toes. Faults: Too heavily coated feet showing an unsightly under part. Fleshy toes. Cat-feet. Long and light coloured nails. Insufficiently coated feet. Skin: Should be thin, often spotted with pigment, whatever the colour of the coat. Pyrenean Shepherd Dog Coat: Long or semi-long but always dense and nearly flat or only with a slight wave, thicker and more woolly on the croup and at the upper thighs, the texture to be something between goat hair and sheep wool. To be shorter and less thick at the muzzle where it should display a “blown back look” including the hair of the cheeks. The eyes must by all means remain visible, never be covered by hair. Faults: Excessive growth of hair on the head, especially if it is covering the eyes and, as far as the muzzle goes, creating any resemblance with the griffon. Bad texture. Open and tight curls. 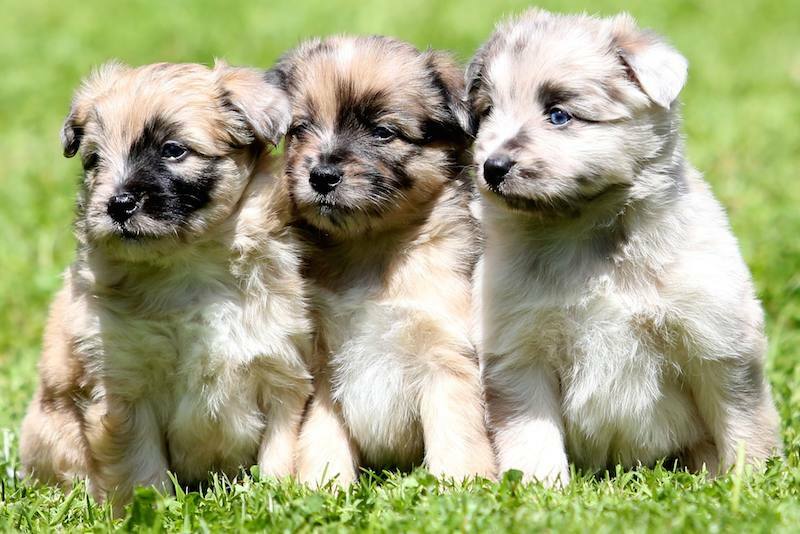 Pyrenean Shepherd Dog Colours: Fawn of lighter or darker shades with or without black shadowing, sometimes with a little white at the head, chest and feet lighter or darker shades of gray, often with white markings at the head, chest and feet. Harlequins in various shades. Black with or without white is rare. Clear colours are preferred. Faults: Too large and too many white markings. Black with tan points. 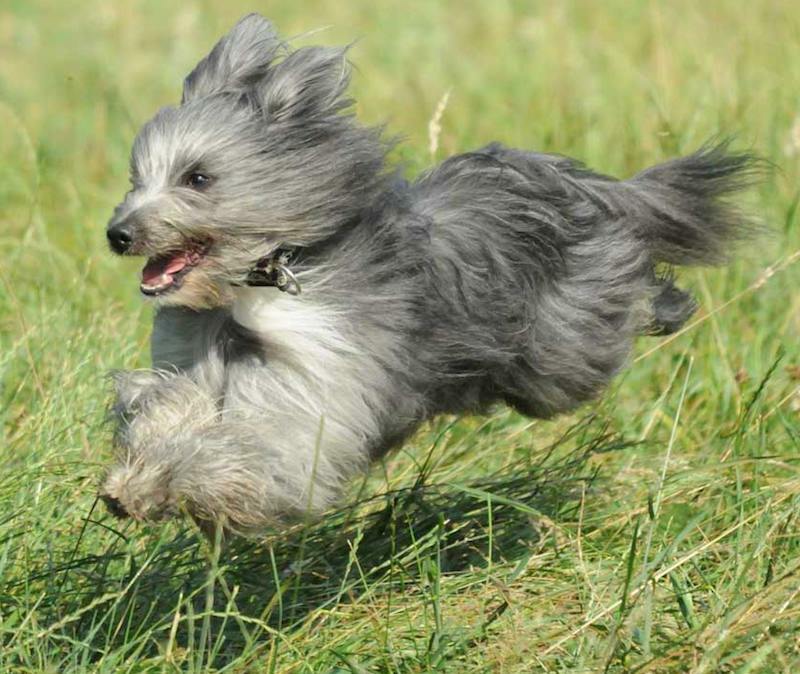 Gait: Because of his overall construction the Pyrenean Shepherd Dog displays a rather restricted pace. Ambling is not penalized but it should be considered that this is foremost a gait used by dogs while working with sheep in order to keep up with their reactions, or in the evening when they are getting tired after a full day’s work. Ambling is therefore not justified in the show ring. 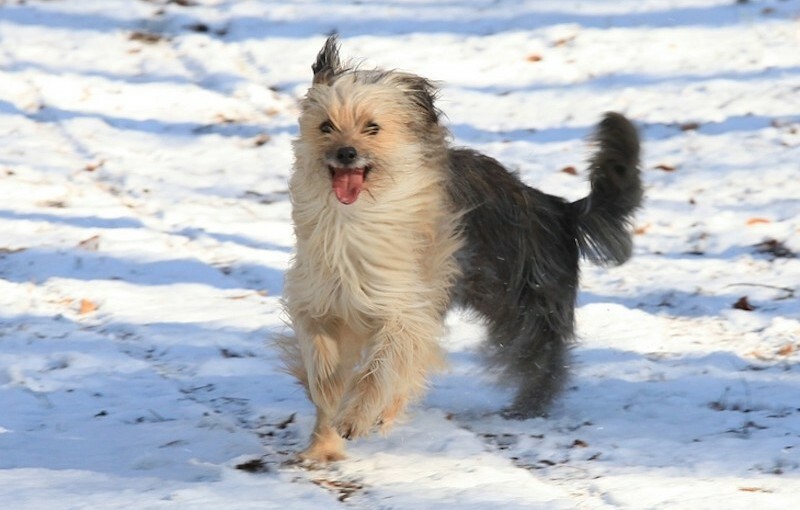 The Pyrenean Shepherd Dog moves mostly at a trot. The latter should be clean and strong. At a slow trot the head is carried somewhat high, at a fast outreaching trot the head is level with the topline. The feet should never be lifted much off the ground. All the movements to be fluid, close to the ground. A correct gait that is pleasing to the eye is the result of good shoulder and rear angulations. Disqualifications: (a) Any size above or under the limits set by the present standard. (b) Nose of any colour other than black. (c) Pearl eyes with any coat other than slate gray or harlequin (d) Over and undershot mouths. (e) Naturally upright standing ears. (f) Cryptorchidism and Monorchidism, that is dogs having only one testicle or none at all.